Okay so since the last post way back when things have changed. This post will be jumbled and might leave you going wha-wha-wha-what? It's things that need to be said though. First off, homeschooling rocks and if you want to see what we have been up to there, shoot me an email for that blog. Second, I have spent several hours contemplating a change in Christmas behaviors. I am the king of over buying and I heart Christmas so much, it kills me not to have tons of brightly colored packages under the tree. 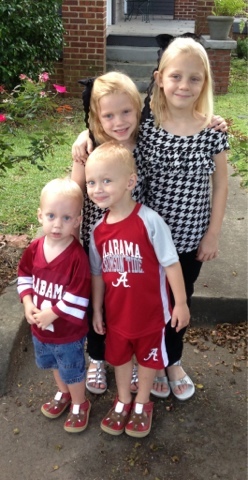 When you multiply tons of awesome gifts times four kids, there is a point you just have to say STOP! And this year I did. Each kid of mine still had 5-7 gifts to open and I did cheat and wrap like gifts together but the volume was way less. And the stress this year was less. Christmas Day was one of my very favorites because it wasn't hurry up and unwrap this because you have 35 more things to go. We enjoyed the day and I have completely given up on the jam packed tree. Oh and the big guy in red, he cut way way way back on his pile of goodies too and I thank him for it. So after this most awesome Christmas, I decided to start yet another new tradition with the kids. I planned to do a 365 day penny challenge (slightly modified) for them to use as a group on an angel tree next year. I was going to call it their giving jar and encourage, read force, them to contribute to it all year with birthday money and change they might get. I knew that even if we only met half the goal of the challenge, it would still be more than enough for them to give. Then, a wonderful young man in my town who was going to go to Haiti in February to be a missionary died in an accident. His mom is my neighbor and his wife was Finn's teacher at a local church's hang out program when they were in school. The kids have spent a lot of piggy bank money at their adoption yard sales and they were just really good people. And it stinks what happened but there is great hope because of his belief in God. 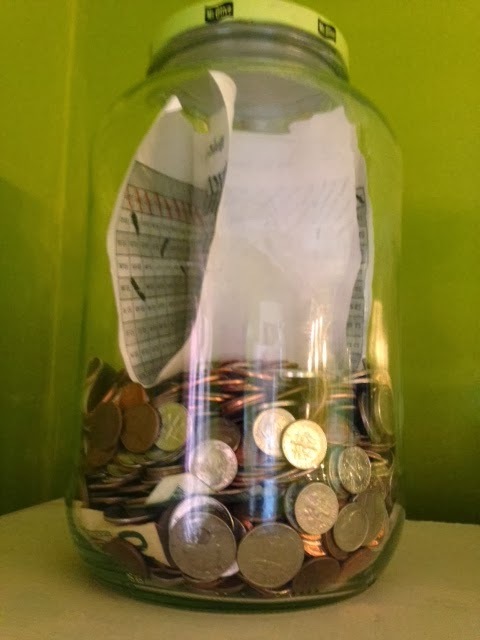 My giving jar idea took on a new mission and the money inside will go to Haiti. Then we will start over and try to raise angel tree money. Then next year, we will fill the jar again and use it for another mission project. So far, we have contributed $131 from piggy banks, change around the house and a couple of donations to make it grow. If we mark off all the boxes we will have $667. We have a long way to go but plenty of time to get there.